First a bit of background to help put this into context. For those of you who haven’t been tracking my progress, I have been an amateur photographer now for the last 8 or so years. I have tried many types of photography, but ultimately enjoyed shooting landscapes and architecture the most. As many artists will tell you, there really never is an end to learning and bettering yourself, and I am no exception. How do you get decent photos even better? I still ask myself this on a daily basis. So I have shot, and shot, and captured, and edited, and shot some more, making adjustments both to my on-location workflow and my editing process. All was fine and dandy in my little world of happy trees and fields. Then around two years ago, I stumbled across images that made my eyes pop out, and my mind go a whirl with wonder. The detail was crisp, the colors were vivid, and the subject matter gritty in a way I had never before experienced visually. It appealed to my visual style and drew me in like a fly to a bug zapper. After considerable research, I found out that the images were made using a High Dynamic Range (HDR) technique. I was hooked! That week, I went to my local Barnes and Noble and picked up “Complete Guide to High Dynamic Range Digital Photography” (Lark Photography Book Series) by Ferrell McCollough. It is fair enough to say that this was one of the best reads I had taken on, as Ferrell puts everything into layman’s terms, and in a pretty fair context compared the top applications. I happily shelled out for Photomatix Pro and started with the single exposures I had already taken up until that point, tone mapping gritty scenes, complete with exacerbated noise, and more halos than an angelic choir. An example of an “Overcooked” HDR has 1. tell-tale signs of halos near high contrast edges and 2. unexpected shadows which are a result of software interpolation in the highlights range. Testing the capabilities and learning a bit about the results of not having enough data for Photomatix to work with, I eventually grew frustrated that I was desperately lacking the clarity of those first images that drew me into this photographic specialty. Then came the time to put into practice what I spent days absorbing through Ferrell’s book and countless Internet sites and go out to shoot my first brackets. It took some trial and error for both on location workflow as well as post processing, but I think I have found a method that works for my gear and software. Let’s start with a few clear cut essentials. Some of these are well documented, and others not so much. Follow them religiously and you’ll be in a much better starting place. TRUST ME! Whenever possible use a tripod! It’s basic Landscape Photography 101. Want crisp images? Then use a tripod. With HDR, this is even more critical because you’ll be merging several images. Any movement will be compounded, thus causing you extra time in post-production. After your lenses, this is probably the one piece of hardware that you do not want to skimp on. I shot for several years with a cheap generic (and flimsy) tripod and didn’t realize how badly that was affecting the sharpness of my images. After I invested some money in a good Manfrotto tripod and head, I noticed a significant improvement in the clarity of my captures. If using a lens that has Vibration Reduction/Image Stabilization (or whatever your brand of camera calls their mechanism to lessen the effects of movement) and you’re using a tripod, DISABLE THE FEATURE. Believe it or not, most lenses that have this feature actually will cause motion blur when on a stable tripod, because it’s trying to compensate for movement that’s not there. On my Nikkor 18-200mm VR, there’s a convenient toggle that lets me disable the VR. If you want crisp images, ALWAYS shoot in Aperture Priority mode. I learned this the hard way when first trying a Fall panorama of my town. I know I had gotten the focus crisp (zoomed in to 100% crop with a test shot). But when I blew up the image on a large format print (12″x48″), everything was super blurry. When I traced things back, and applied a little physics and computer engineering theory, I realized that I shot the bracket groups (I’ll talk about these in more detail below) in full Manual Mode. The issue with this is that is, even though you’re in Manual mode, the auto bracketing WILL change the Aperture on you, thus giving you varying depths of focus. 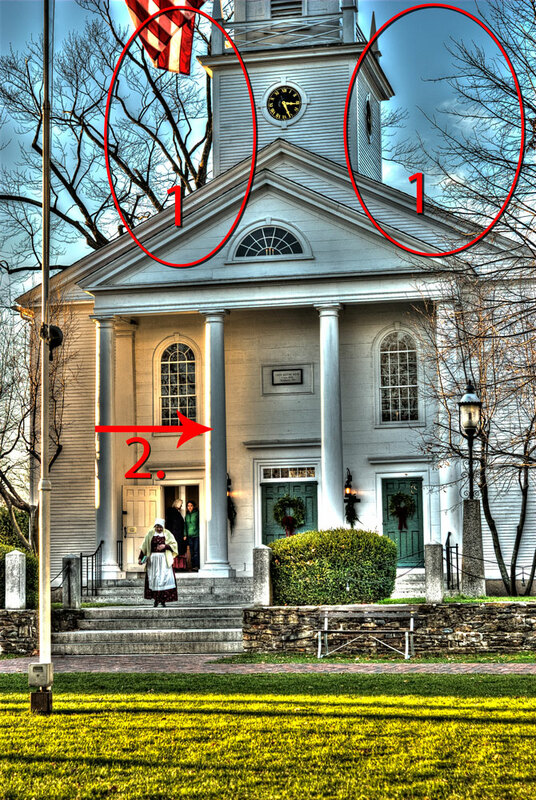 And when you merge the exposures in Photomatix, you’ll lose most of your sharp focus. As soon as I switched to Aperture Priority Mode, I got the crisp, tone mapped images I was planning on getting. ALWAYS shoot in RAW format. JPG files are compressed file formats which means data that you could use for tone mapping likely has been removed for the sake of file size. Shooting in your camera’s native RAW format means you’ll retain as much of the light data as possible, which will help get you to your final stunningly detailed image. Nikon RAW files are “.NEF” files. Canon RAW files are “.CR2”. Consult your camera’s User Manual to learn how to switch file formats. Use a remote; preferably a wireless remote. It is a big help with reducing camera shake, thus resulting in sharper images. This is probably as good a point as any to talk a bit more in detail about High Dynamic Range (HDR) Photography. To sum it up as concisely as I can, HDR is a process of capturing as much light (as data) of a particular scene as possible. Even the best camera on the market can capture only a small fraction of light that the human eye can see at one time. So by taking many shots of the same thing, that are unique in exposure values (typically in increments of 1/3 to 1 stop or EV) and combining them using specialized software, you can effectively capture much more detail (light) in the three major ranges; Shadows, Midtones and Highlights. The end result being a highly detailed and visually stunning photo. I kick it up a notch by also combining HDR with panoramas. So how does one know if they are getting the right amount of exposures? Meet your new best friend, the histogram! Essentially, the histogram is an efficient way to show you a particular image’s light data. The horizontal axis describes the dynamic range of light, starting with the Shadows on the left, Midtones in the center and Highlights to the right. The vertical axis describes the amplitude of light at any given point of dynamic range. So the higher the waveform, the more light, and thus detail you have at that range. In the example above, we can see the combined light channels in the topmost graph (Red, Green, Blue, Cyan, Magenta, Yellow), and each of the major light channels (Red, Green, Blue) broken out in the lower graphs. If any point on the graphs maxes out at the top of the graphs, we refer to that as “Clipping”. Clipping in most cases is BAD and will result in unnatural areas of your image. The main goal that HDR photographers try hard to achieve is to have the final histogram of their collective exposures fill as much of the histogram without any clipping. This is done through the tone mapping process and leveraging physics in that light is additive (Mr. Demers is probably happy that I retained something from his high school physics class from 20+ years ago). Most DSLR cameras have a similar onboard histogram, so you can get this information in the field. In this “Behind the Scenes” shot , you can see that the histogram is active in the preview mode that appears after each shot. This is useful for knowing if you need another exposure bracket. This entry was posted in Technique and tagged HDR, HDR photography, panorama, productivity, techniques, tone mapping. Bookmark the permalink. Thank you for the opportunity John! It has been a lot of fun collaborating and sharing knowledge! Dan, you are the man!! Fantastic start to the three-part tutorial, can’t thank you enough for sharing your knowledge with us, I appreciate the effort you had to put in to gain that knowledge yourself. Roll on Part two! Thanks again, John. I am really glad that you are enjoying it so far, John! 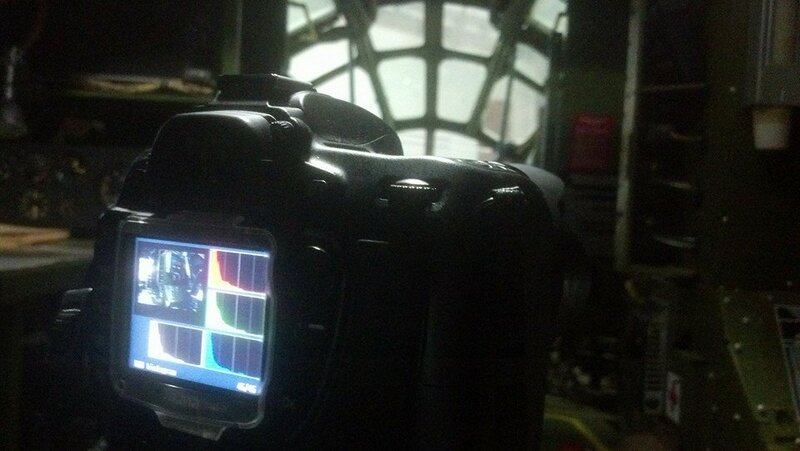 Part Two and Three are going to dive into the actual process I took while photographing at the New England Air Museum. If you have any questions, please feel free to ask here or on the board! And feel free to share this link with other friends and family who are interested in Photography.